Battlefield is using Smore newsletters to spread the word online. 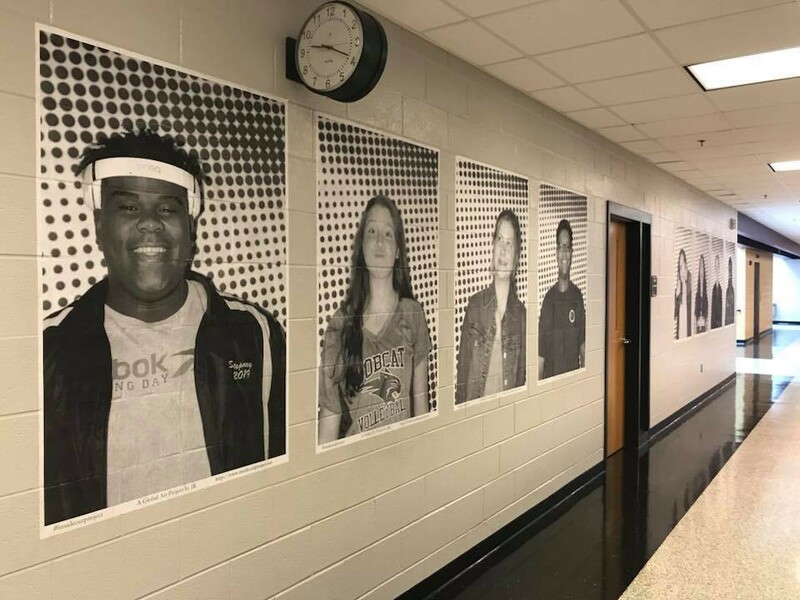 Learn More About the Battlefield HS Black Student Union! Congratulations to the following staff members for their dedication of Breaking bariers and building bridges. The following were nominated by fellow colleagues so make sure to say congratulations when you see them! Rose Hummel, Secretary: Rose is a miracle worker! She supports not one, but TWO administrators, and does so with a smile on her face. Not only that, but she builds relationships with our students, even if she's not "responsible for them." She learns their names, speaking to them kindly when they pop into the office; she truly wants them to know they're welcome and cared for. She also goes out of her way to see what other administrative assistants need help with, often working in the attendance office to assist when we're short-handed. Thank you for all you do, Rose! You're irreplaceable! Lauren Vance, Science Teacher: Lauren works overtime to ensure all students are reaching mastery. As the CLT leader for Biology, she works with her fellow teachers to ensure assessments fit all learning targets to match all students' mastery of objectives. 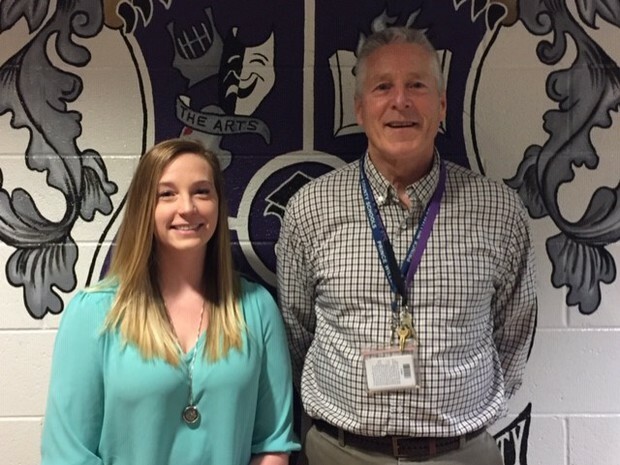 She works with students on her planning periods, before school, after school, and during lunches. This is breaking the barriers that prevent many students from success. John Chrisinger, Criminal Justice Teacher: Mr. Chrisinger consistently displays the demeanor and enthusiasm necessary in a professional educator. His "Can Do" spirit and heartfelt greetings to staff, faculty, and students are a welcome aspect of working at Battlefield. He arrives early, engages his students on both a professional and personal basis and is always willing to help the team accomplish its goals. His instruction provides necessary life lessons for his students and he adds real world experience to his curriculum by bringing his valuable law enforcement career knowledge to the students. I've watched Mr. Chrisinger grow from a first year teacher to a seasoned veteran and recommend him wholeheartedly as a person who "Builds Bridges and Breaks Down Barriers". Cat McMaster, Librarian: Cat has initiated the Teachers as Readers program, which brings together faculty, counselors, and office staff. She makes every student feel welcome in the library, and encourages kids who are struggling with their work. On the IOIC team, she looks for solutions that will improve instruction and the school culture. 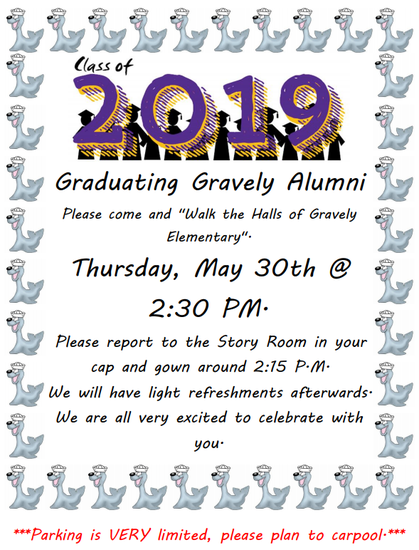 Attention Senior Parents- Graduation will be here before you know it! 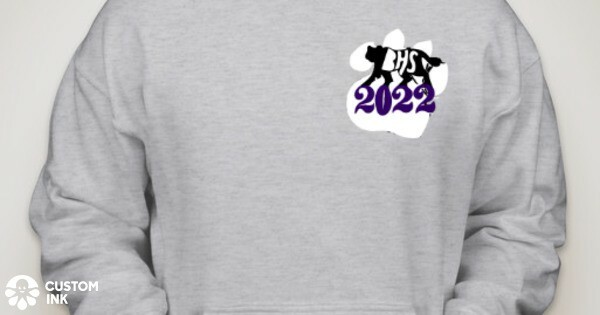 It’s not too late to order your student's cap and gown at http://www.balfournova.com. They'll ship directly to your home sometime the end of April/first part of May. 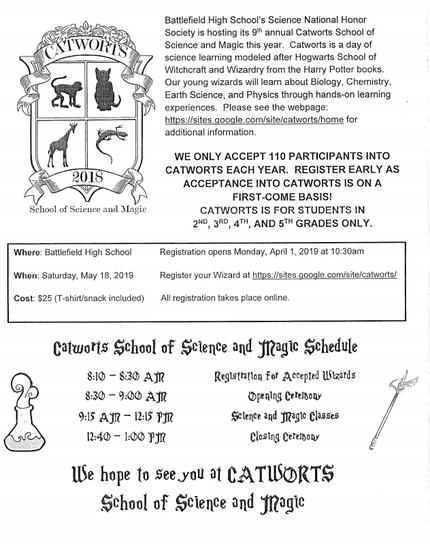 Please contact Balfour with any questions 703-941-1436 or balfournova@yahoo.com. 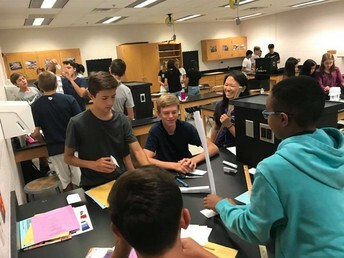 Dates have been set for the Prince William County Public Schools 2019 Summer School Program. Find them in this web announcement. 1st Semester Honor Roll has been updated! Due to an error in the logic of the Honor Roll report, high schools have been advised to re-run it for 1st semester. First semester Honor Roll lists were re-calculated and re-posted as of 3/22/19. It’s time for student to pick their gifted service options for next year. To register for your chosen service options, please go to the BFHS homepage. 4. Please choose the link for next year’s grade. 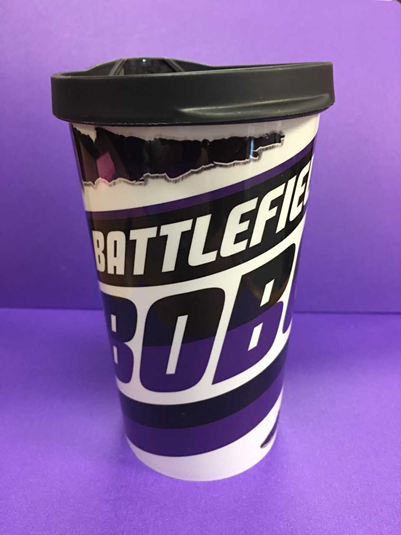 If you know any 9th or 10th grade or transfer students, who could use a Battlefield Big Brother/Big Sister, please complete the BB/BS referral form. 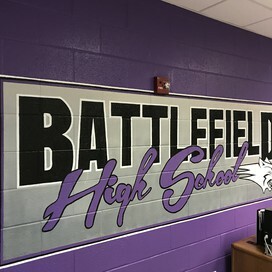 Upperclassmen are looking to help younger students or transfer students feel connected to Battlefield. Our Bobcat volunteers aim to utilize student interests to guide their activities. Though we only have a quarter to go, there is plenty of time to make a difference for a student! The Big Brothers and Big Sisters will include parents when connecting with students email. 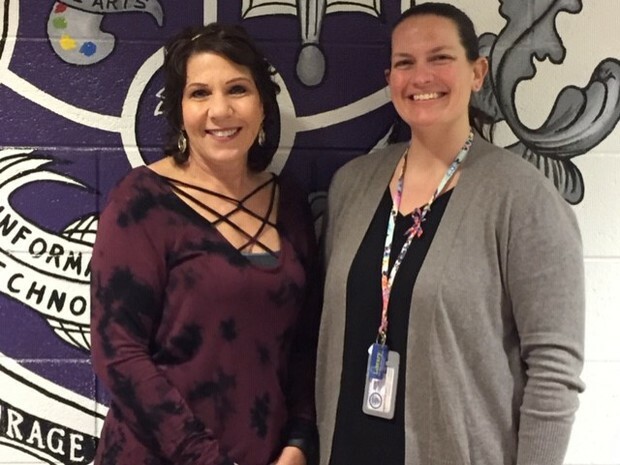 The Pickup, an original play written by Hadley Scott, Julia Hyde, Maddy Henderson, and Jamie Keller, will be produced by T. Benton Gayle Middle School in Fredericksburg. This play was written in Mr. Bridges' creative writing class, expanded and performed by Battlefield Theatre at the Virginia Theatre Association conference in Norfolk, VA in October. At that performance, Ms. Messinger at T. Benton Gayle loved the script so much that she asked for permission to produce it. Some of the writers will travel to the middle school to watch the play put on again, and to meet with the young performers. "You were notified earlier this year of a change to graduation requirements for our freshmen, as well as a new testing regulation, which omits students from further SOL testing once they have fulfilled their graduation requirements. Students have begun meeting with their counselors about their specific graduation plans. Attached you'll find the necessary form to opt your student(s) in to additional or student "choice" SOLs. The form should be submitted to the front office by April 8, and again, is necessary only for the purposes of opting in to a specific SOL test. You may also see our SOL page for this document and additional remediation information, as it is decided within departments." Social Studies: reviews will be after school on Wednesdays starting Wed., March 27, with individual teachers who are holding sessions. If your teacher is not holding a review session on a necessary date, please ask the teacher for a location of review on that date. Another teacher will welcome the you in! Activity buses will run from April 2-May 9, on Monday through Thursday afternoons. “Are you a 10th grade Battlefield High School student currently taking driver education through health and physical education class? Did you attend your 90-minute student/parent driver education meeting? "Sports serve society by providing vivid examples of excellence." Are you a student-athlete who wants to grow as a leader in the school, community, and beyond? Consider joining the Student Athlete Leadership Team, aka SALT, an extension of our SALC program. 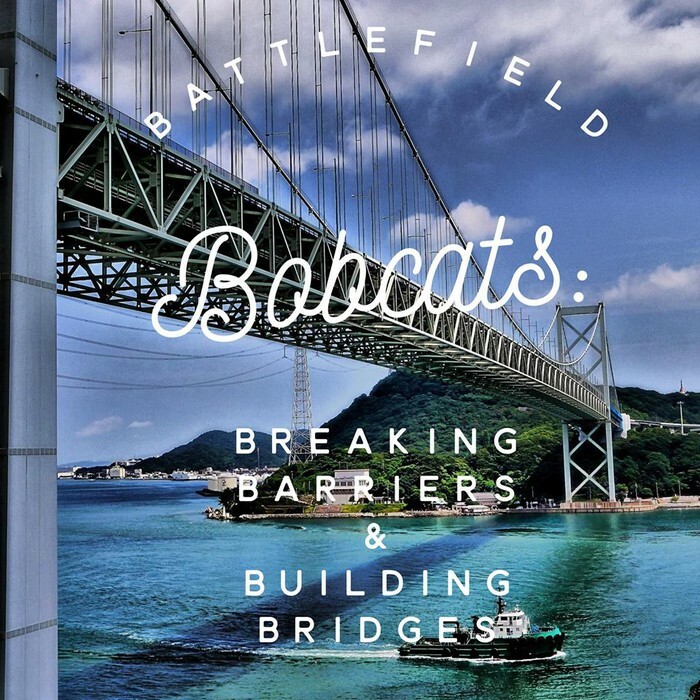 We will help bridge the gap between athletic teams and students for a lasting legacy of leadership. Bobcats! 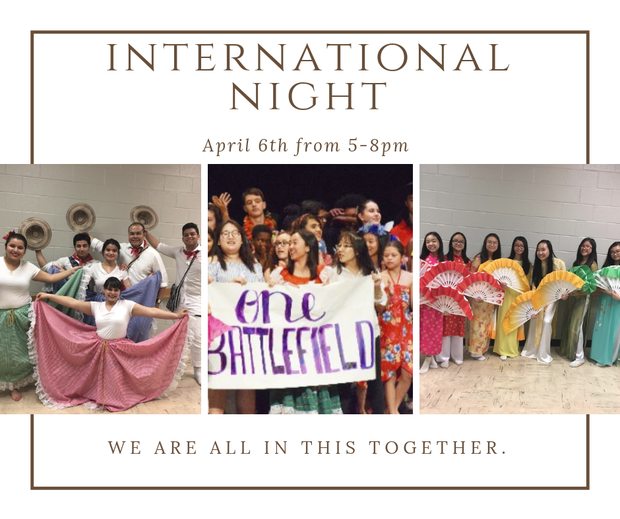 The 11th annual International Night is coming featuring fashion, food ,music and dance from around the world! BHS orchestra, color guard, UDC, Step Team along with original KPop, Indian, Vietnamese, Latin and Polynesian dances will be featured. Plus, Reagan Middle School’s very own Steel Drum Band will take the stage under the direction of Mr. Vince Prinzivalli! Come check out this amazingly positive and fun tradition to help us all celebrate our community’s diversity! We Are All In This Together!! 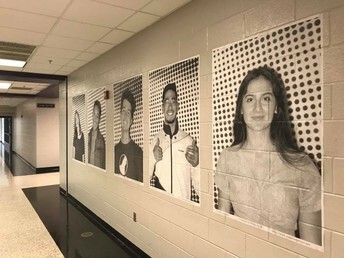 Sophomore mock interviews will take place on Thursday and Friday, April 11 and 12, 2019, in the library at Battlefield High School, Haymarket, Va. The event is hosted by our English 10 team. If you are a business owner or have interview experience (or a parent who wants to meet some great kids), you will enjoy this opportunity. As a member of our community, you will have an opportunity to sit with our students in five- minute mock-interviews. Students will be dressed to impress and have a résumé. We will provide you with a guided list of questions, or you may create your own. Students will come prepared to answer questions related to their fields of interest, as indicated on their résumés, or "generic" job interview questions. 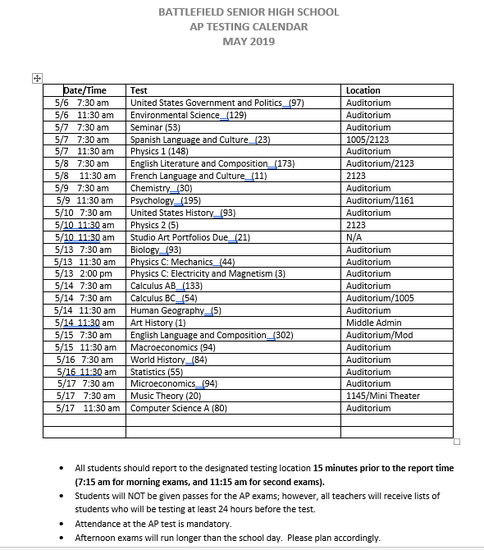 Please email Julie Graves (gravesjv@pwcs.edu) or Jennifer Marshak (Marshaja1@pwcs.edu) with further questions; they will be in touch via email with further details, including information regarding expectations from interviewers, sample questions you can ask, and how to score the students. In Case You Missed It: Battlefield High School Lip Sync 2018! · $3,000 IN SENIOR SCHOLARSHIPS are up for grabs! Application deadline is April 22, 2019 and is available here. For your senior to be eligible, you must have already be a PTO member by December 31st. · AFTER GRAD will be held on graduation night, June 5, 2019 from 10:30pm to 3:30am at the Freedom Aquatic & Fitness Center. This is an alcohol/drug-free celebration full of fun activities, prizes and tons of food. Activities for this all-nighter includes a gaming truck, caricatures, henna artist, silent disco, palm readers, swimming, open basketball courts, mechanical bull, giveaways, AND SO MUCH MORE! All for the price of $35 for the first 150 tickets sold! Price after that is $45. To get your tickets, please click here. This event’s success depends on our volunteers. Please consider either donating your time or prizes by clicking here. If you are interested in serving on the committee this year or for next year, please send an email to bhsptomemberatlarge@gmail.com. · INTERESTED IN BEING PART OF THE PTO BOARD NEXT YEAR? Nominations for PTO board positions (president, vice-president, secretary, treasurer, and member-at-large) are being accepted. If you would like to nominate yourself or another parent, please send your nominations to bhsptopresident@gmail.com. Elections will be held at our May 1, 2019 PTO meeting. · Next PTO General Meeting is on Wednesday, May 1st from 7:00PM to 8:00PM at the BHS Library. 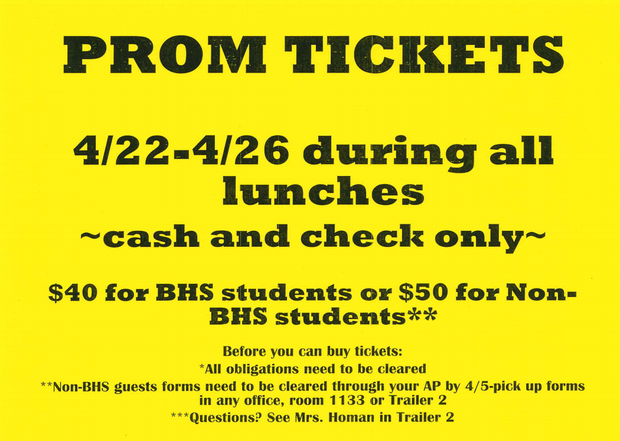 See Jason or Gina to Purchase in the Satellite Office!